Ranging from 4 oz and 5 oz in material weight, this heavy duty landscape fabric provides dependable weed protection as well as soil stabilization. There are various landscaping materials that are commonly used, but have many downsides unlike landscape fabrics. Read on and discover why more and more landscapers are choosing landscape fabrics instead of other materials. Organic mulches will eventually decompose and increases once in contact with soil. Unfortunately, as the decomposition increases the ground becomes a fertile bed for weeds. 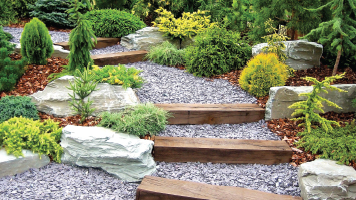 Crushed stones are inorganic mulch and will not decompose. Stones will quickly work their way into the soil, they draw enormous heat and are a mess to clean up. Similar to crushed stone, black plastic will not decompose but is much easier to clean up. Unfortunately, like crushed stone, it draws enormous heat and also prevents air, nutrients and water from getting into the soil. This will cause problems when it's time to place your plants in this area. Unlike black plastic, landscape fabrics let in air, nutrients and water and is a clean, durable weed barrier. 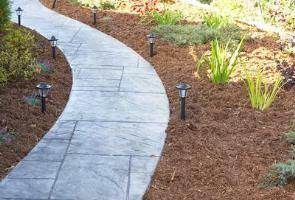 If organic mulch is placed over landscape fabric it will break down much slower than if placed directly onto the soil. In areas that are larger than the landscape fabric, use as many sheets as needed to cover the area by placing them adjacent to each other and overlapping. If they are not overlapping, weeds can sprout up through the seams. 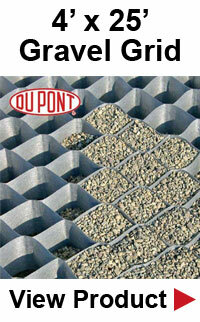 The makers of landscape fabric advise overlapping by 3 inches but play it safe, increase the overlapping to 6 inches. When installing the fabric, make sure the shiny side faces up and pin down or use heavy objects to hold the fabric down if it's a windy day, otherwise it could blow away. Landscape fabric pins can be inserted into the fabric to pin it down. Do not go overboard with pins, once you have placed mulch over the fabric the weight will hold it down. It's suggested you place pins every ten feet along the edges and the overlapping seams. After placing the mulch over the fabric, use a steel rake to spread it out evenly. Keep the incisions as small as you can. Make slits in the fabric vs cutting out sections of the fabric. Keep in mind, this area of the fabric is a planting bed and you will be glad you took the time and energy to control the weeds. By taking your time to ensure weeds will not pop up and overtake the area, you have saved yourself a great deal of unwanted hard work. Because you created an x-shaped incision, you have created four flaps. Separate the flaps so you will have access to the soil area for planting. You should have a container or wheel barrow nearby instead of shoveling the soil onto the landscape fabric. Remember that the less soil that you have on top of the landscape fabric the less potential weeds you will have because reduced soil thickness will help to reduce weed-seed germination. Once your small hole has been dug out, place your plant. Place soil around the plant and tamp down to curtail air pockets. Once you have finished planting, take the four flaps of cut fabric and place them snugly against the base of your plant. You should not have any gaps in the fabric as this, in turn, will lead to weeds. After all is done, a new layer of mulch is applied but away from the base of the plant. If mulch is up against the base of the plant, you will attract diseases and pests. Landscaping fabric is truly one of the best ways to cut back on weeds that can harm your garden plants. As great as this fabric is, it's not 100% weed resistant. A very common mistake is cutting the fabric too short. In order to get a perfect size, lay the fabric over the area you are going to be using and then cut. You probably should cut it a little bit larger than the area. As mentioned earlier, some areas are larger than the fabric. 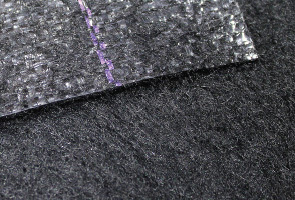 A common mistake is not overlapping the fabric properly. Keep in mind, ground moves, soils settle and other natural occurrences can cause the fabric to shift. Keeping the fabric overlapped by at least 4 inches (preferably 6 inches) will prevent this from happening. Always make sure your fabric has been pinned or staked in place, weather conditions such as high winds can carry your fabric away. Keep in mind that no matter what ground you place your fabric on, it will not necessarily stay intact. Ground freezes and then thaws causing the fabric to move. If there are twigs or rocks on the ground they can tear the fabric. If torn, this will lead to weeds, slugs and other insects creeping into your garden. Do not lay down too much mulch as it can hamper your plant's roots from getting proper nutrients, air and water. Also, weeds don't need a great deal of mulch to start growing, so only apply a 2 to 3 inch layer. Landscaping technology has come a very long way and landscaping fabric is an excellent choice for preventing weeds, diseases and pests. Unlike black plastic, landscaping fabric is porous allowing air, water and nutrients to get into the soil and feed your plant's roots.